A team of Australian scientists has just completed a phase one human clinical trial with an ingestible biosensor that can measure gas produced by the gut, and potentially transmit results to a connected smartphone. According to the researchers, their results showed a higher rate of sensitivity and specificity than current methods used to diagnose common gastrointestinal (GI) diseases, such as irritable bowel syndrome (IBS) or colon cancer. The National Institutes of Health estimate that between 60 and 70 million Americans suffer from some form of GI disease, accounting for 43 million annual visits to ambulatory care centers. These conditions represent a substantial burden on the U.S. healthcare system, with endoscopic procedures and their associated risks representing a large portion of the U.S.’ $152 billion in direct and indirect annual costs related to GI conditions. Recent research in breathalyzer technology has produced diagnostics that are much less invasive, while also being more portable and affordable than many current options. U.K. scientists recently revealed a cancer-detecting breath test indicated for certain forms of stomach and esophageal cancers, and similar diagnostics currently are one of the only ways to diagnose conditions like IBS. Kalantar-zadeh and his team’s solution was to design an ingestible biosensor, powered by biocompatible silver oxide batteries, that can measure different types of intestinal gas, with a built-in microprocessor that can wirelessly transmit data to a mobile device. A gas-permeable membrane allows the sensor to analyze gasses while keeping the sensor safe from corrosive digestive acid, according to the team’s proof-of-concept study, published by Gastroenterology in 2016. 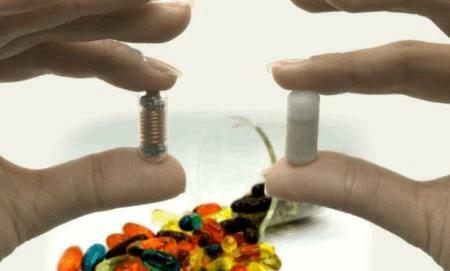 In a recent study published in ACS Sensors, the RMIT team discussed the future of ingestible sensing capsules, which they say are “fast emerging as a critical technology that could greatly impact” how clinicians monitor health, disease, and nutrition. Co-developer Kyle Berean commented that the capsule could also reliably diagnose colon cancer, thereby replacing colonoscopies. MIT recently introduced ingestible device technology that could monitor vital signs acoustically, freeing patients from uncomfortable — and in some cases infeasible — external monitoring. The device is capable of analyzing sound and translating that data into heart and respiratory rates.